'The Trial of Thor' Review: A hodgepodge collection of lost Thor stories – AiPT! With Thor: Ragnarok around the corner, Marvel has released several new trade paperbacks starring the Norse god of Thunder. One of them is The Trial of Thor, which is effectively a modern rarities collection. It’s a group of one-shots, an annual, a short story and a four-issue miniseries crammed into a hefty $30 volume. While there’s no origin for Thor in the book, it’s still a fun group of self-contained stories with fantastic art that newcommers will enjoy. 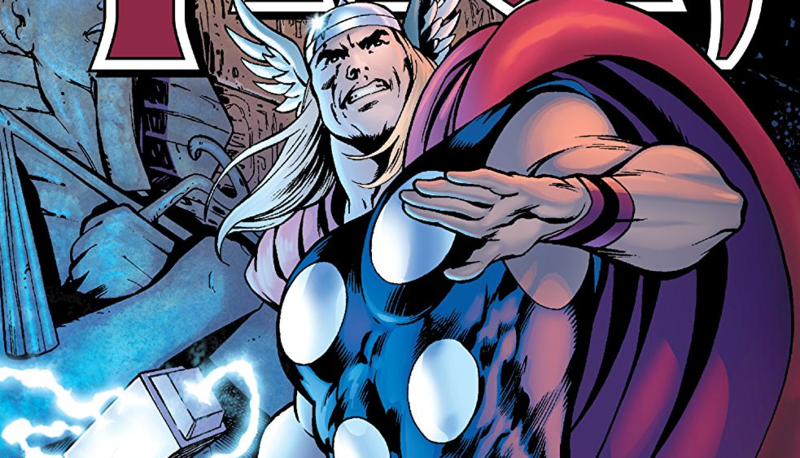 The collection kicks off with the lighthearted 2008 one-shot Thor: The Truth of History. Written and drawn by Alan Davis (The Uncanny X-Men), this is a breezy story about how Thor, Volstagg, Fandral and Hogun played an important role in freeing the Ancient Egyptians from the rule of an evil Pharaoh who has animal/human hybrids fighting by his side. What’s most fun about this is the frame story, where two Egyptologists who look awfully similar to Laurel and Hardy argue over the true date of the Sphinx. Next up is the 2010 one-shot Thor: Wolves of the North written by Mike Carey (X-Men: Legacy) and Mike Perkins (The Stand). This one features the villain of Ragnarok, Hela (played by Cate Blanchett in the film), who is letting demons run wild on Midgard and has struck a deal with a local priest who hopes to stop the daughter of the tribal leader from taking over. This one is jam-packed with as much action as possible, and Perkins’ art is very dark and well done. Carey’s story does feel a little rushed to get through in a single issue though. That’s followed by the titular story, 2009’s Trial of Thor, written by Peter Milligan (X-Men) with art by Cary Nord. In this one-shot, Thor is accused of murder and Odin has The Warriors Three investigate. Of course, Thor isn’t really a murderer and he’s stunned that his own father would accuse him of such a thing. This plot spills over into the following one-shot included here, 2010’s The Rage of Thor, also written by Milligan. Nord is replaced by Mico Suayan (Moon Knight), whose work has a gorgeous, painterly quality to it. In Rage, Thor has banished himself from Asgard, and even fallen in love with a woman in Midgard. But after four years without Thor, Asgard needs him back and he begrudgingly answers the call. The art in both Trial and Rage is the highlight, but Milligan’s writing is a little heavy-handed, with pointless narration that gets in the way of telling the story. Milligan returns again for Thor Annual 2009: “The Hand of Gorg.” This story might be a little confusing for those who aren’t familiar with the time Thor was a weak god who needed the help of Don Blake as his host. Again, the art is the highlight, although it’s by two artists. Suayan draws the framing scenes in Celestial Heliopolis, where Seth plots to destroy the weakened Thor. Tom Grindberg (Silver Surfer) draws the scenes on earth. Despite its length, the story moves very quickly, with big panels and little dialogue in each. It’s a fun, action-packed issue, but certainly not the highlight of this collection. Ready for more Milligan? He makes one final appearance in this book as the author of “Dinner With Doom,” a short story from the 2009 one-shot Dark Reign: The Cabal. I have no idea why this is included. It’s an eight-page conversation between Loki as a woman and Doom. No other story in this book features Loki as a woman or has anything else to do with the Dark Reign event. So this is a bizarre inclusion that only seems to be here to pad the page count. It was drawn by Tonci Zonjic. The main feature of the book, even though it’s titled The Trial of Thor, is Paul Jenkins’ four-issue miniseries Thor: Heaven & Earth. Published in fall 2011, the story was previously collected, although that original collection is out of print. Each issue tells a different and fascinating story, linked by Thor’s own quest to find his place in the universe. Ariel Olivetti, Mark Texeira, Pascal Alixe and Lan Medina each draw an issue in the series. The best of them is the third issue, where Thor is questioned by a Catholic priest who wonders about his own faith when he witnesses Thor in action. Marvel also includes a few sketch pages in the back of the book. Overall, The Trial of Thor is a hit-and-miss package, with some good Thor stories that might otherwise get lost in the shuffle. Strangely, the title story (and its follow-up) isn’t the best part of the book. Heaven & Earth is a fascinating look at how even a god needs to find his purpose and the other one-shots show how hard it is for anyone to run from their past. If you’re roaming a book store looking for a Thor book to read before seeing Ragnarok, this is a good buy. This is an excellent book for both a Thor newcommer looking for easily accessible adventures and longtime fans of the character looking to fill in some holes in their collection. Each artist brings their own original vision of Thor and Asgard to the table and they are uniformly great. "Truth of History" and "Wolves of the North" are the best stories, while Heaven & Earth is a more contemplative look at Thor. Not all the stories are great. Some parts of Heaven & Earth are forgettable and the titular story is not one of the best in here.